His right-hand woman at Chanel, Virginie Viard, who has now taken the reins at the iconic label, will present what is officially his final collection on the last day of the shows on March 5. It is still not clear how much of the collection was created by Lagerfeld, who died on February 19 aged 85. He had leaned heavily on Viard, his head of studio, in his final months. The workaholic German, who always insisted that he would design until he dropped, drew his creations by hand and then handed them on to Viard to realize. "I understand him and I can sublimate what he wants to do and bring to Chanel," she told AFP in a 2015 interview. Chanel would not comment on whether next week's show will include a homage to Lagerfeld, saying only that "a farewell ceremony will take place at a later date." Under Lagerfeld, Chanel staged spectacular shows at the vast Grand Palais in central Paris. But illness stopped him from attending its haute couture show there in January - the first time he ever missed a Chanel show - with Viard taking the bow at the end. At October's spring-summer show, Lagerfeld went out of his way to acknowledge Viard, who took the bow alongside him. The Decorative Arts Museum in Paris has put on display four of Lagerfeld's most famous creations for Chanel and Chloe, which he also transformed, in the first official tribute to his creative genius. 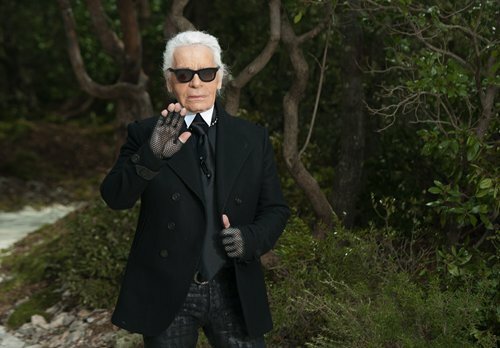 Internet resale sites have reported a huge spike in interest for Lagerfeld's work since his death. Such is "the Kaiser's" enduring influence, that youthful Berlin-based label Ottolinger led its show on Monday with a series of acid-tinged tartan twin set outfits that were a cheeky millennials' take on Lagerfeld's Chanel classics. Its Swiss creators Christa Bosch and Cosima Gadient also took a leaf out of Lagerfeld's book by wittily batting off the comparison. "No, we thought of them first," they jokily told AFP. With British designer Phoebe Philo talked of as a possible successor at Chanel long term, one of her former acolytes at Celine, South Korean-born Rok Hwang, kicked off fashion week's nine packed days with a highly assured Paris debut. The London-based creator - who grew up in a caravan in Austin, Texas - won the prestigious LVMH special prize last year, and the deconstructed trench coats and fluid paisley scarf dresses in his autumn winter collection won him more fans in the French capital. His designs for his own Rokh label have more than a little of Philo's quiet, minimalist sophistication, and he clearly has a talent for making the edgy seem wearable and mainstream. All eyes later in the week will be on debut collections for new designers at three major French historic labels - Lacoste, Lanvin and Nina Ricci. Louise Trotter brings a rock-solid reputation to Lacoste from her years at Joseph, Calvin Klein and Tommy Hilfiger. France's longest running but troubled couture house, Lanvin, passes into the hands of young French designer Bruno Sialelli, while the radical Dutch couple Rushemy Botter and Lisi Herrebrugh present their first collection since taking over Nina Ricci.